After much time and patience sourcing finer quality and coloured opaque diamonds, I thought I share two rings from my most recent collection of opaque diamond rings. Both rings are now up on the website for purchase. If you would like to see the rings in person, they and can be viewed at Pieces of Eight Gallery in Melbourne. Each ring is hand made and carefully prepared to seat each individual stone. 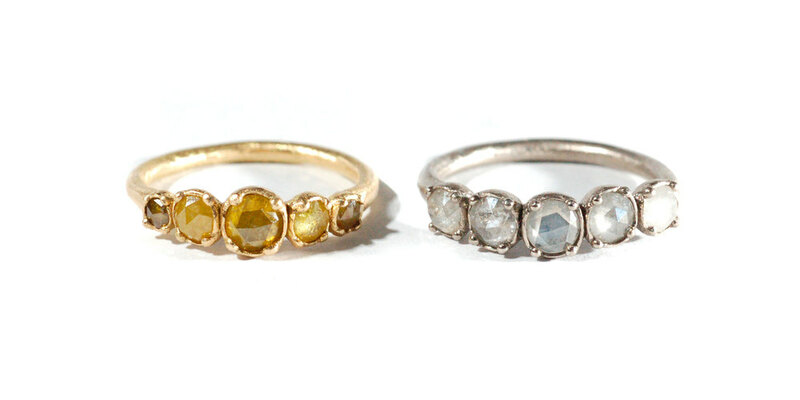 The ring on the left is 18KT yellow gold, set with intense 'sunset yellow', rose cut, opaque diamonds. The ring on the right is 18KT white gold, set with fresh 'arctic white', rose cut, opaque diamonds. Ive mentioned this in past posts but for the benefit of those that missed the posts, the beauty of opaque diamonds is that each stone is incredibly unique with no two stones ever alike. The rings in themselves are always a little different but its the stones, with their subtle, natural inclusions, that ultimately make each of these rings truly individual. I have another parcel of coloured opaque diamonds on its way, which is exciting. I haven't seen the stones but I believe my trusty merchant (thanks Salman) has included some pink opaques! Im thinking a rose gold version of this ring? I will post an image as soon as its done !